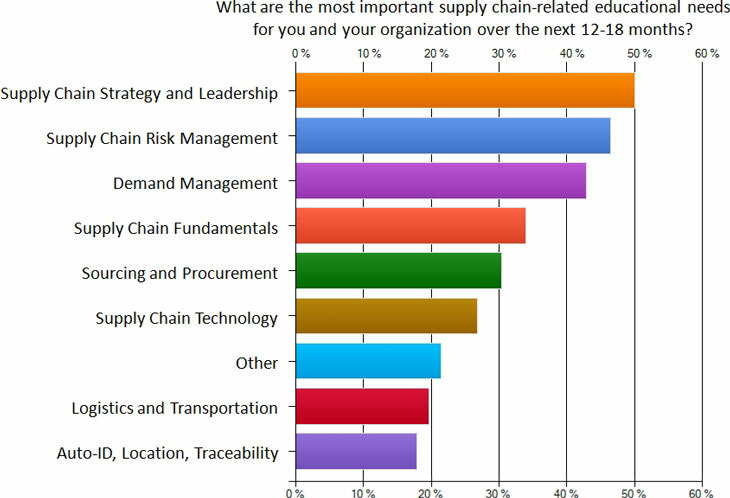 ChainLink Research conducted a survey on the current state of supply chain education and needs for 2011. Our research showed the need for less theoretical, more practical education, and other significant findings as well. This is the first in our three part series on the state of supply chain education today. As shown in Figure 1 below, people feel lukewarm about how well we are doing in supply chain education. Are existing supply chain education programs covering the right subjects and with good content? Sort of. Do they have great instructors? Not really. And are courses convenient to attend and reasonably priced? No! So there is definitely room for improvement. In fact, the comments we received on the state of education tended to be more negative than the survey numbers above suggest. For example one person said, “Offered programs are parochial in nature, designed to drive sales of a vendor’s tools or services, or are too generic to be of value. For example, [a major prestigious university] doesn't even understand its own legacy in systems thinking. Supply chains are complex and there are no easy fixes. Grossly simplified views perpetuate myths and drive the wrong solutions.” Not exactly a resounding endorsement. Some comments were even harsher, which we won’t publish here as they would be considered “flaming” if this were a blog.